Back in October, it was announced that Lucifer’s second season would have nine more episodes than originally ordered, rounding things out to 22 episodes. The way this season had been going (and continued to go after the announcement), it was absolutely a case of more being better and even something of a reward for fans sticking through the rockier beginnings of the series. Then in December, it was revealed that the last four episodes would be more standalone and even experimental, only for another announcement in March revealing that those four wouldn’t air until the Fall, with the series’ third season. The good news, however, was that the new season finale—episode 18, “The Good, The Bad, And The Crispy”— had been written as the conclusion to this season’s major arcs, so even with the schedule shifting, the season would still end the way it was meant to. Yet, even with that knowledge, something doesn’t feel quite right about Lucifer ending things here and now. Perhaps it’s just the simple knowledge that the writers were able to come up with four more episodes of material (after what seems like a pretty good endpoint) for the rest of the season that makes the uneasiness palpable. Maybe it’s a matter of being somewhat greedy for more Lucifer after it’s found its groove. Either way, it should be noted that this feeling is more in line with the good kind of anxiety than anything else, as by the end of the episode, there’s only greater anticipation for what the Lucifer writers have in store. Because while most shows’ season finales come with the writers honestly having no idea what they’ll do for next season and how they’ll get their characters out of their previous season quandaries, Lucifer promises the opposite. It’s both something to appreciate and something to obsess over throughout the summer. But to dwell on these scheduling choices right now (as I just did) is coincidentally to ignore the prevalent theme in “The Good, The Bad, And The Crispy,” the concept of moving forward (and never backward). It’s worth noting that the beginning of Dan’s character rehabilitation this season involved him telling Chloe they shouldn’t try to move backward in their relationship and instead try to move forward, in the form of their official divorce. So this has been the point of season two from the very beginning, only it’s just now getting around to explicitly saying it. 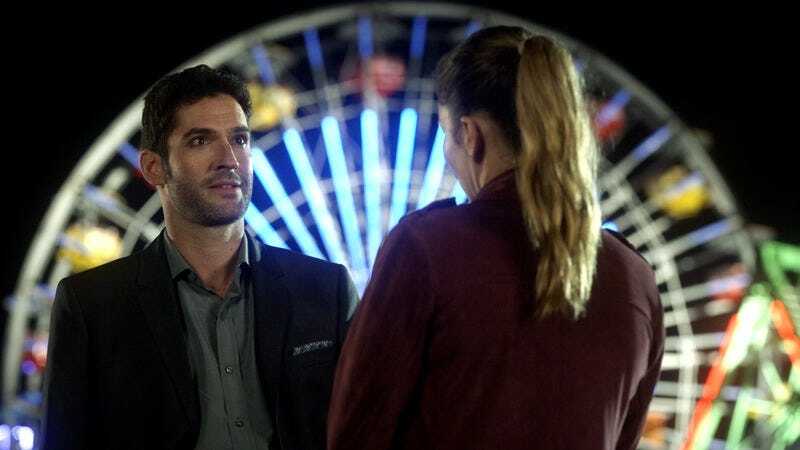 Obviously, Lucifer’s relationships with Dr. Linda and Chloe are all about him moving forward as a “person,” but though the show’s called Lucifer, that doesn’t mean he’s the only one who has to go through that kind of progress. Maze’s arc this season has been all about moving forward (thanks to Dr. Linda’s sage advice), and it’s one that comes full circle in this episode. She began this season lost, looking for a sense of purpose and a world outside of Lucifer, and now she has a career she loves along with a circle of friends (besides just Lucifer) that she’d go to Hell and back for. Figuratively but also literally if she really had to. For Maze, this season ends with her doing all she possibly can to show just how much she’s grown and moved forward, whether it’s playing along with Dr. Trixie or pleading for help in saving Dr. Linda. And they’re both times when violence just won’t do. As for her relationship with Lucifer, even after last week’s much-needed therapy session, Maze still realizes boundaries are necessary in their relationship, which is why she does something like charge Lucifer her standard fee for bounty hunting Amenadiel and Charlotte. Chloe, on the other hand, is a character whose evolutionary path is a little bit different from everyone else’s, mostly due to the fact that her big moment of moving forward will be when she finally learns the truth—a reveal that will eventually open up so many new story avenues for her character. Unlike everyone else (besides maybe Dr. Linda and Trixie), moving backward isn’t a big concern for the character, especially when so much of the show’s existence is based on her eventual form of moving forward. With a little help from Lucifer’s own moving forward, that is. On the other hand, going backward—in a sense—actually appears to be the key for Amenadiel’s growth in this episode. Amenadiel has self-admittedly been a bit directionless since losing his powers and wings… except for when it came to being his mother’s loyal son, because the role as the loyal son has always been one he knows well. It’s a role he doesn’t need his powers to fulfill. And while it’s somewhat sad for him to desperately want to follow orders, as a soldier, it’s really all he knows. It would be one thing if Amenadiel realized here that he doesn’t want to be a soldier, only to continue with that life because it’s all he knows; but as he does his soul-searching and thinks through what it means for him to be God’s favorite son, he realizes that being the good soldier and loyal son (to his father) is what he wants, what fulfills him. So it’s moving backward, but it’s also forward momentum in terms of the actual character motivation. Unsurprisingly—and delightfully, as he’s genuinely excited, not just rubbing it in—Amenadiel is on a high from learning that he’s their father’s favorite, and even less surprisingly, Lucifer believes it’s less a show of support from God and more one of manipulation. As Chloe even points out, the fact that their father even picks a favorite child in the first place isn’t good parenting at all. Lucifer is right to assume God’s engaging in another act of manipulation with this “favorite son” designation. And the more into the idea that Amenadiel gets, the more it appears like Lucifer’s actually right and Amenadiel is on his way to another fall. But the thing is, when it comes to God’s manipulation, that doesn’t necessarily mean it’s for the worst. That describes the entire Chloe/Lucifer situation, but it also applies to how Amenadiel comes to the conclusion that “falling” was a test from God, one that he failed. It’s a realization that causes him to regain his faith, as well as one that returns his powers. He doesn’t have his powers back completely, but it’s still enough to save the day and bring back a little bit of what he’s been missing this season. As for Charlotte, she’s well on her way to fully moving backward with this particular episode, as she physically threatens Dr. Linda to get information that she wants, goes full ticking time bomb to get the Flaming Sword piece, and generally gives up on any and all rational thought she may have left. That last part is understandable, given all the staples and duct tape holding her together, but as a character who’s been a wildcard all season, this is the episode where bad turns very much to worse. But the thing about Charlotte’s violent behavior and acts of desperation here are that they’re not fun or even just unintentionally tone deaf; they’re terrifying, and it shows just how bad things are for her right now. 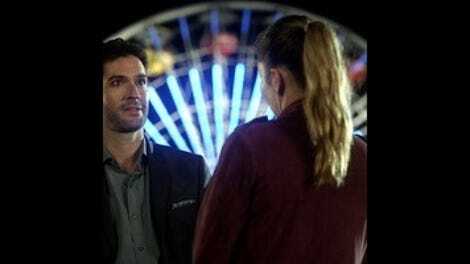 Upon seeing Charlotte at the Santa Monica pier, my mind immediately went to what her ultimatum for Lucifer would be, and even after what she did to Dr. Linda, it’s still shocking. Because for all her indifference toward humanity, it’s quite the big deal for her to decide to possibly destroy so much of it at a place with families—with children—as retaliation for the possibility of never seeing her own children again. She’s that broken by this point—after finding out Lucifer was never on her side and Amenadiel no longer is—after starting the episode with her own tiny amount of faith. The way Charlotte gets choked up when she says “I can see my children” (after Lucifer tells her that Amenadiel has the final piece) is a beautiful bit of acting by Tricia Helfer, and if this is the end of the Charlotte we know, then this episode is quite the swan song. But the entire Charlotte arc doesn’t quite work if Lucifer doesn’t move forward in this relationship as well. Lucifer is the punisher, and he’s so ready to remind everyone of that after Charlotte threatens Chloe’s life (which, amusingly, Chloe doesn’t realize has happened). But getting vengeance against his mother or even his father (by unleashing her on him) isn’t going to help things in the long run, and it’s here that Lucifer realizes that. Lucifer, the lover who’s not a fighter, brings up the very real fact that by returning his other to Heaven, it’s basically ensuring that there will be nothing but bloodshed among the rest of family. Those children she wants to see so much—just like her children on Earth—will have to choose sides, and there will be casualties. So as much as Lucifer wants his mother and father to both face the consequences of their actions, that doesn’t mean he wants the rest of his family to suffer for it. It never has. For Lucifer to think past the immediate “joy” of Mom and Dad duking it out and to also remember that (as much as he tries to spin it) Hell isn’t the place to send her either, in favor of creating a new world for his mother to inhabit and make in her own image: That’s one of the most mature decisions he’s ever made. Even before he heads to Dr. Linda’s hospital room to apologize and before he leaves a voicemail for Chloe, promising to finally tell the whole truth, Lucifer has already gone through quite the moment of moving forward. He made a whole new world for his mother, not because she “deserved” it but because it was the best course of action, for everybody. As for that ever-present case-of-the-week, it’s more a technicality (as a result of last week’s scorcher of an ending) than a true focus for the episode, especially as it’s not a matter of if Chloe will be able to make her way to Charlotte: It’s a matter of when. Lucifer says the same thing, and he’s absolutely right, as Lucifer’s about as bad at stalling a case as Chloe is at working undercover. The plot, as small as it truly is compared to everything else, absolutely gets points for surprisingly evoking the memory of Sunshine Cleaning in the form of Dandy Lyon Cleaners, but as with a lot of Lucifer’s weaker (yet fuller) cases, there are those aspects that remind the audience that the procedural elements are rarely the show’s strongest aspects. First, there’s the second immolation in the form of Ava Lyon and the assumption that the audience should also believe Charlotte was responsible for it… even though that would mean Charlotte went from Lucifer’s wine cellar to the cleaners and then to Dr. Linda, despite the urgency with which she wanted to know what Linda knew about Lucifer’s plans. As for Chet’s brother Hector actually being the bad guy this week, while he may have been introduced as a good guy, his backstory also involved him moving to Mexico to supposedly get away from his family’s evil empire, an empire of which tequila was a huge factor. Mexico was literally the last place he should’ve moved to in order to stay away from his family and legit. When he confronts Charlotte and complains about how, as their lawyer, she was supposed to protect them, of course it’s no surprise he was lying before. It’s all usually the type of case-of-the-week weakness that can really mess with an episode, but this one is truly saved by the case simply being about Chloe catching up to Charlotte and everything else that’s happening in finale world. Now, about that ending. Before you can even really say it’s a cop-out for Lucifer to get knocked out and kidnapped as he’s on his way to reveal the truth to Chloe, Lucifer wakes up in the desert, shirtless and sporting his wings. I honestly have no clue what the conclusion to this episode means for Lucifer, and that’s where those remaining four episodes come into play again. Will they immediately answer that question? Will they go with another “Where’s Lucifer?” story? How on Earth did he get his wings back? Who knocked him out? What just happened? Like I said, I haven’t a clue. But it’s a season ending that seemingly promises to follow through on something I found myself thinking about early on in this episode: As fascinating as this season has been from a character study perspective, I really wouldn’t mind a little more emphasis on the more supernatural, divine part of it all in season three. In fact, I would welcome it, because Lucifer has proven its ability on the character front. Presumably, budget restrictions have been the main reason behind characters like Lucifer and Amenadiel having their wings clipped or falling, but at the same time, it’s hard to deny how cool that aspect of the show can be. That Lucifer decided not to make Amenadiel’s condition permanent and simply a test from God also feels like a type of a promise when it comes to the more supernatural aspects of the show. At the very least, “The Good, The Bad, And The Crispy” is a season finale that makes that further potential for Lucifer abundantly clear. Let’s talk about Lucifer’s “quite literally toast” line before the title card. For once, Lucifer is quite serious with one of his cheesy lines… and I have to deduct points for the episode not even showing Dr. Linda’s reaction to such a line. Because while he was absolutely serious, that doesn’t make it any less ridiculous. Trixie: “You don’t have to speak in code. I can handle adult stuff.” Until that line, I was actually shocked Lucifer and Maze were speaking so frankly in front of Trixie about everything that’s going on. Trixie: “Sorry. Wussies don’t get any.” All topped off with an adorable fist bump between Trixie and Maze. Ella: “Oh, right Yes. Your ‘dad’ is always watching.” This and Ella saying Lucifer’s family “seem totally bonkers” are such necessary lines, as they’re small moments that remind us—or at least reinforce for us—that while she goes along with the whole “method actor” thing for Lucifer, she’s not actually blind to how weird things are. Ella may be perky, but she is not oblivious. This episode doesn’t address the elephant in the room of what Maze did to the Chairman of the Review Board, but pre-Charlotte, Dr. Linda seems good, so I guess that settles that. Though, for all we know, Linda could live in her office. We’re still at a point where Dr. Linda isn’t at the level of full character that everyone else has become, and that’s part of what makes her mortality up in the air this episode: Were the writers simply to kill her, it would essentially be like a Get Out Of Jail Free card re: them not giving her a life outside these shenanigans. Instead, the episode actually doubles down on her wanting to be involved with them (as that ride or die nature is responsible for the episode title), but time will tell how that will open things up for the character. I truly do hope that this near death experience is a way for the writers to turn the corner with the character though. Amenadiel: “You’re a good man, Daniel.” Never forget this is a line that could never be said with any type of seriousness back in the first season. He really has come a long way this year. And he’s teaching improv classes now! Speaking of the improv scenes, time to add that to list of things Amenadiel doesn’t quite get about humanity. Funnily enough, a drama or public speaking class would be right up his alley when it comes to dealing with his “favorite son” situation. And now I’m imagining “aspiring actor Amenadiel” for season three. Poor Dan. As far as he knew, Charlotte was a mess and very bad for him… but he also knew that she liked him a lot (in her weird way), and he clearly liked her too, despite his best judgment. The real Charlotte Richards just isn’t the same. Though she’s definitely still not a great person, but it’s different when it’s in a human way. Also, poor Lucifer, after she responds to him with the fact that her children are 10 years old.